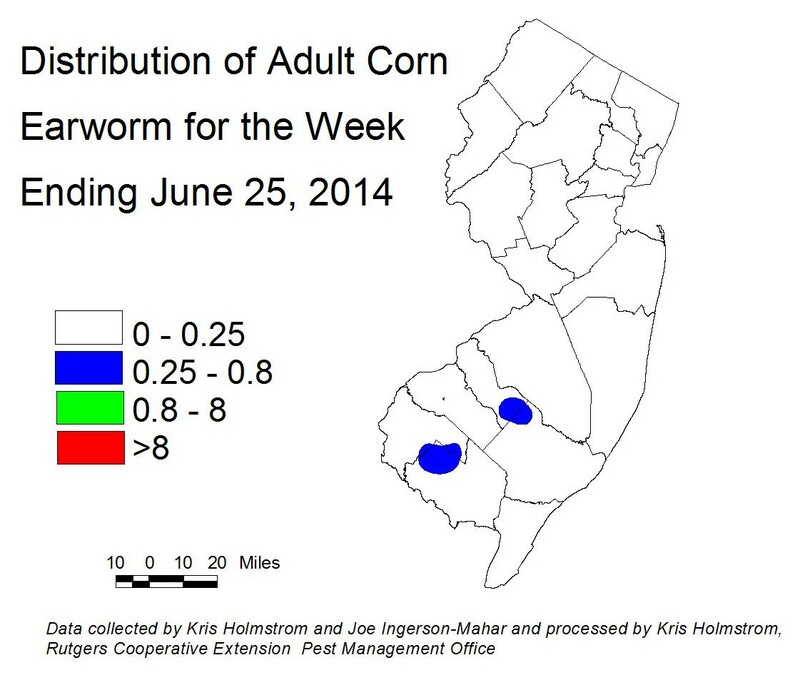 European Corn Borer (ECB) adult catches are declining throughout the northern half of the state, while somewhat higher activity remains in parts of Camden, Gloucester, Hunterdon and Atlantic counties (see ECB map). Larval infestations in sweet corn are increasing dramatically on whorl and pre-tassel stage corn throughout the state. Infestation rates above 70% have been found in northern counties this week. 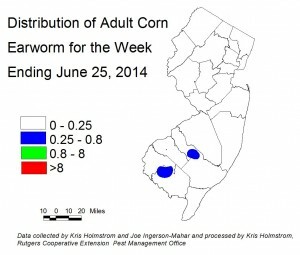 Blacklight Trap Corn Earworm Moth (CEW): Several corn earworm moths (CEW) were captured in blacklights in Atlantic, Cumberland and Salem counties this past week (See CEW map). While still low, these catches represent a slight increase over the previous week. Pheromone Trap Corn Earworm Moth (CEW): Catches are gradually increasing in pheromone traps in the southern counties (see CEW pheromone trap map). Green areas on the map roughly correspond to a 4-day silk spray schedule, although the relatively few number of pheromone traps results in a broad green band which does not reflect local differences. Highest activity is near western Gloucester County and from western Atlantic County north through southern Burlington. Despite the low moth numbers, sweet corn plantings now in silk in southern NJ are at risk for ear infestation if CEW is not properly controlled. As silks begin to appear, pay close attention to CEW catches in local blacklight traps, and treat silking plantings accordingly. Pupa is enclosed by webbing. Heavy egg laying by imported cabbage butterflies (ICW) and diamondback moth (DBM) continues. Infestations of these pests have been found throughout the state. Scout plantings weekly. Check 5 consecutive plants each in 10 random locations throughout the planting, paying particular attention to the innermost leaves where ICW often feed. Consider treating if caterpillars are found on 10% or more plants that are in the 0-9 true leaf stage. From 9-leaf to the early head stage (in broccoli, cauliflower and cabbage) infestations up to 20% may be tolerated. Once heads begin to form, a 5% threshold should be observed to protect the marketable portion of the plant. For leafy greens such as collards and kale, 10% plants infested is the threshold throughout. It is important to distinguish between DBM and ICW because in many cases, DBM are resistant to synthetic pyrethroid insecticides. 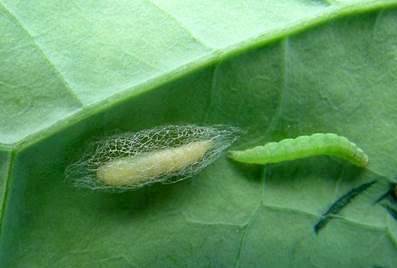 DBM are the smallest of the caterpillar pests of cole crops. Larvae generally are less than 3/8” long, and they taper toward both ends. DBM wriggle violently when disturbed. Pupae are enclosed in webbing and will be attached to the underside of leaves. Field scouts are reporting that, in some cases, after treatment only DBM remain in the field. If DBM is the dominant pest, or makes up more than a few percent of the overall infestation, consider using one of the newer chemistries. These include spinetoram (Radiant), chlorantraniprole (Coragen), and flubendiamide (Synapse/Belt). The latter two materials have the added benefit of not harming bees or predatory/parasitic insects. 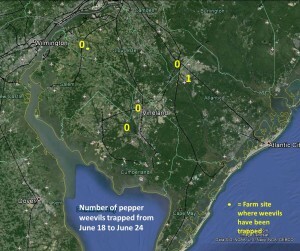 Trap counts remain quite low with only one weevil caught in the past week (see pepper weevil trap catch map). There are no known field infestations. Timely insecticide treatments before the plants were setting fruit has prevented one field from having an established infestation. Location of fields is also important. Only one field lies within a mile radius of the trap in the Swedesboro area. 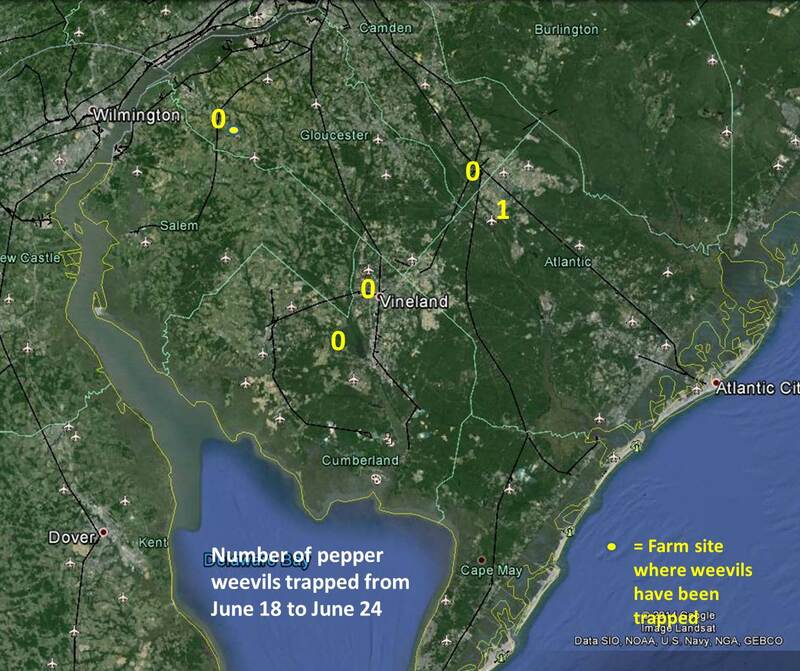 This was the hardest hit area with weevil in 2013 when there was a concentration of pepper and tomato fields. Colorado potato beetle (CPB) feeding has been occurring for the past few weeks, and activity has recently reached the northern counties. Be sure to inspect fields at least weekly for the presence of adults and larvae. Field inspections should include areas adjacent to last years’ host crop (eggplant, potato and tomato, as well as the perennial weed, horsenettle). If infestations are localized it may be possible to spot treat. Remember that if a neonicotinoid insecticide (imadicloprid or related material) was used at planting, it is not advisable to use a similar product as a foliar spray, as this may hasten resistance in the local CPB population. See the 2014 Commercial Vegetable Production Recommendations for materials useful in controlling CPB. There was a slight spike in adult BMSB activity late last week, although this has since subsided. Overall, adult activity continues to be well behind in 2014. As adult captures increase to 5/night in parts of the state, maps will be produced to show where activity is highest. Information on scouting, crop injury and control will also be included. Potato leafhopper (PLH) adults have appeared in snap beans in the northern counties this week, and should be considered present in all areas. This pest is a particular problem because it often goes unnoticed until foliar distortion and burn occurs. Once this damage appears, yields have already been compromised. It is critical that beans be monitored regularly for the presence of PLH. If a sweep net is available, consider treating if more than 100 nymphs and adults are present in 20 sweeps of pre-bloom stage plants. This threshold increases to 250 during bloom and to 500 per 20 sweeps during pod development. If no sweep net is available, check plants in 10 random field locations and consider treating if adults and nymphs are found throughout. Adults are pale green, and will fly out from foliage when disturbed and immediately fly back into the plant canopy. Nymphs are wingless and bright green and may be found on the underside of leaves.